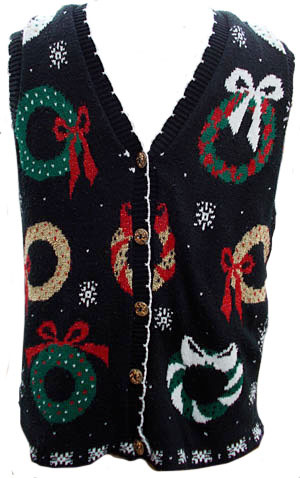 Home > Men's Vintage Shirts > Ugly Tacky Christmas Sweaters > (mens Snug 2XL) soft n'squishy Ugly Xmas sweater Vest with Wreaths. Gold buttons! Soft an' squishy ugly Xmas sweater vest. Black with white, green, red, and glittery gold wreaths adorned with bows. White snowflakes surround and on the back. Fancy gold buttons. White tipped scalloped edging. Tag reads Willow Ridge. 100% acrylic. Condition: Very Good. Has some very light pilling. Does not detract from the awesomeness of this sweater!